Airports Authority of India is going to recruit fresher candidates in India for Senior Assistant & Assistant Posts. So, those candidates who are willing to work with this organization they May apply for this post. Last Date of Apply 14-June-2017. Total numbers of vacancies are 20 Posts. Only those candidates are eligible who have passed B.Com with computer training course of 3 to 6 months with 2 years relevant experience in the concerned discipline/ Post Graduate degree in Hindi with English as a subject at the Graduate level or Post Graduate degree in English with Hindi as a subject at the Graduate level. 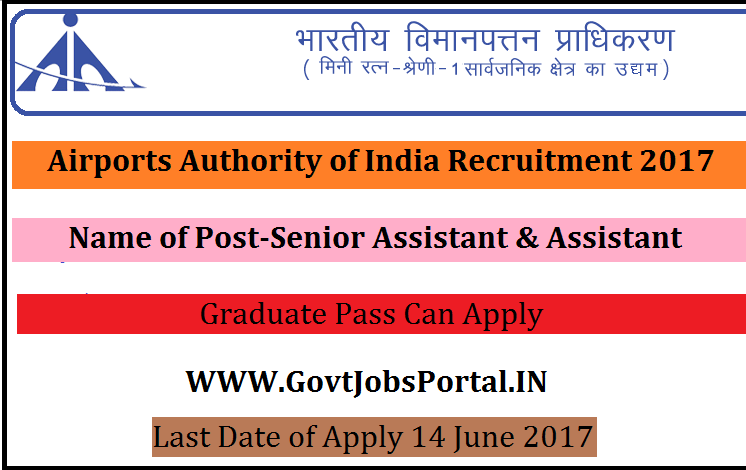 Indian citizen having age in between 20 to 35 years can apply for this Airports Authority of India Recruitment 2017. Educational Criteria: Only those candidates are eligible who have passed B.Com with computer training course of 3 to 6 months with 2 years relevant experience in the concerned discipline/ Post Graduate degree in Hindi with English as a subject at the Graduate level or Post Graduate degree in English with Hindi as a subject at the Graduate level.